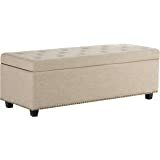 Infuse everyday elegance into any room with this First Hill storage ottoman bench. 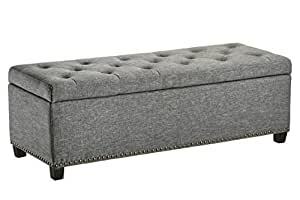 More than just an accent piece, the wide ottoman bench provides both graceful seating and handy storage. 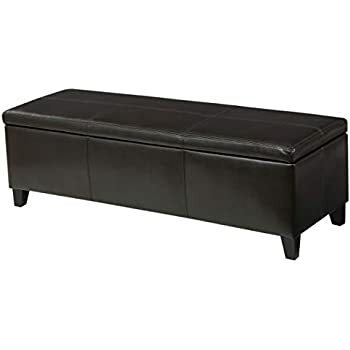 The unit’s rectangular shape includes rounded corners for a soft profile, while its four, easy-to-attach, slightly flared feet provide strength and stability. 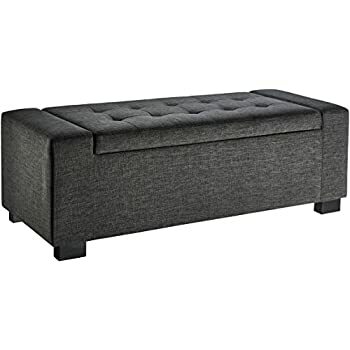 The extremely versatile HRF storage ottoman bench measures approximately 48 by 17 by 16 inches (LxWxH) and offers a space-savvy storage solution for the home. 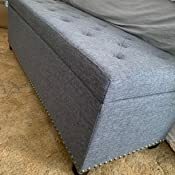 The ottoman works well at the foot of a bed with folded blankets tucked away inside. 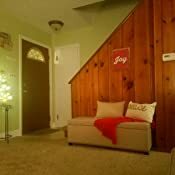 Or place it by a front door with accent pillows for a comfortable spot to sit while slipping off boots or shoes. Slide the ottoman bench into place as additional seating during a party, or turn it into a cozy coffee table with a serving tray on top. 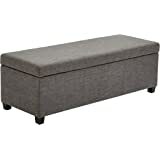 The multi-purpose First Hill storage ottoman bench makes a useful addition to any well loved home. 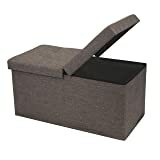 The sturdy ottoman’s durable wood construction combines solid pine and plywood for long-lasting strength. 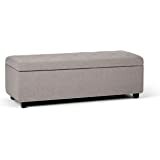 Slate-grey, linen-like fabric upholstery covers the ottoman’s exterior, and a tufted diamond design on top creates a welcoming place to sit. 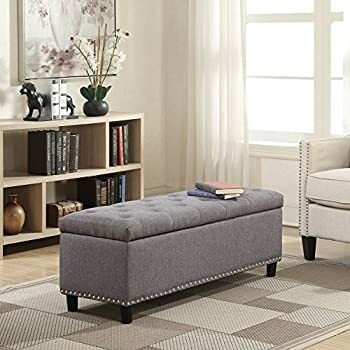 Even more, a single row of decorative nail-head trim along the lower edge of the ottoman offers added eye-catching detail. 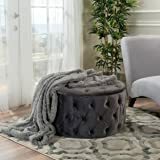 The ottoman’s lid lifts to reveal storage space inside—perfect for anything from seasonal clothing and extra pillows to shoes, board games, books, and more. 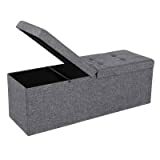 A reliable hinge promotes smooth opening and closing of the lid (no slamming to worry about). 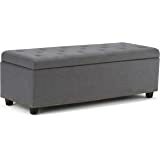 Keep personal spaces looking neat and tidy with help from the HRF storage ottoman bench. 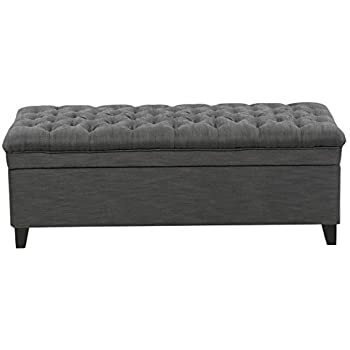 Infuse everyday elegance into any room with this First Hill storage ottoman bench. 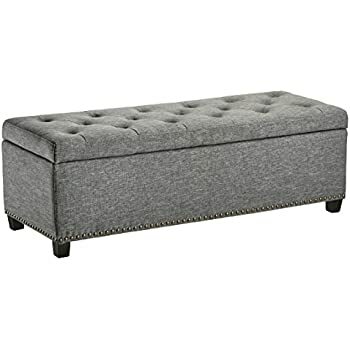 More than just an accent piece, the wide ottoman bench provides both graceful seating and handy storage. 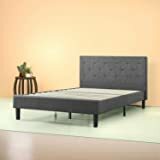 The unit’s rectangular shape includes rounded corners for a soft profile, while its four, easy-to-attach, slightly flared feet provide strength and stability. 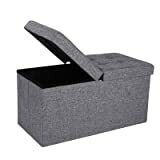 The extremely versatile First Hill storage ottoman bench measures approximately 48 by 17 by 16 inches (LxWxH) and offers a space-savvy storage solution for the home. Just as described. Easy to assemble. You just need to screw on the feet. Fits perfectly at the foot of my king bed. 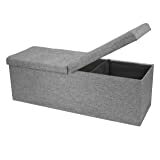 It is a bit more shallow than I imagined, but I am able to store an extra blanket and a few pillows in it, which was the plan. It doesn't take up too much space and provides needed storage and seating. It's perfect for my specific need. My room is black and white, so grey is a good transition/neutral color. 5.0 out of 5 starsFunctional and really stylish. Great quality! 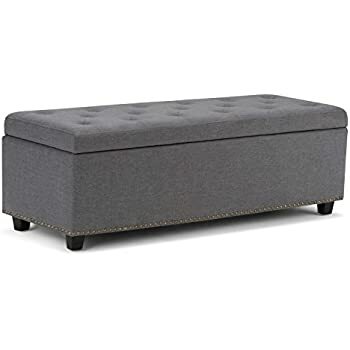 I was a little iffy at first and hesitant to purchase this ottoman bench... I was afraid the quality would not be good or that it would look cheap but I am IN LOVE!!! 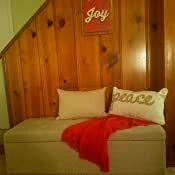 this is just the right accent for this spot in my living room! 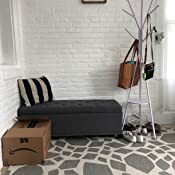 It's very sturdy, came in very well packaged and super easy to assemble. NO TOOLS NEEDED, twist the legs on and done! 4.0 out of 5 starsNice bench! We bought two that fit under a table that the grands use for drawing, coloring and playing games. 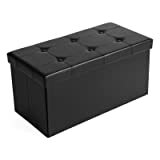 My only complaint is they are very heavy when we put the supplies inside so we bought rolling wheels and installed on both and now they are wonderful! Move easy enough that the kids can move them in and out from the table. They are nice! Fits just right for a queen size bed. Color is a little off from photos versus eyes. Taking this photo for my review shows the color more similar to the product. To my eye it looks blueish grey. But other than that i love it. 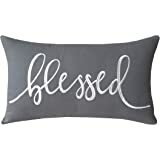 I bought this in gray which was also nice, but decided the lighter color was better for the room. 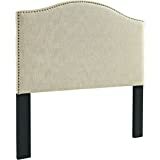 Great quality on the tufted top as well as the brass rivets along the bottom. It is very deep and holds a lot! The hinges are spring loaded so it opens very nicely. I wish I needed another but would definitely buy again and recommend.